The Freedom From Religion Foundation is legally contesting an unconstitutional Wisconsin religion-centered counseling state program. 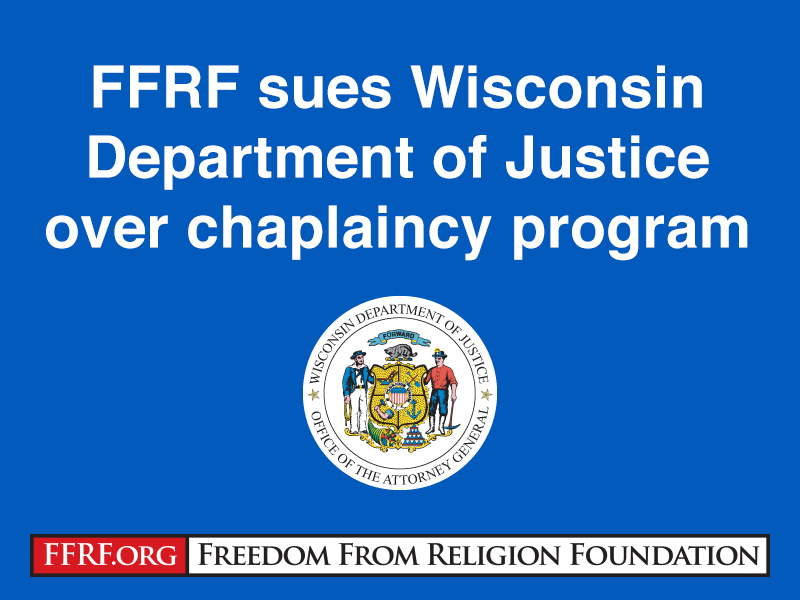 In a lawsuit filed today in a Dane County court, FFRF is challenging the constitutionality of a faith-based employee chaplaincy that Wisconsin Attorney General Brad Schimel created at the state Department of Justice. Schimel, who was defeated in his bid for re-election on Nov. 6, announced the chaplaincy program in mid-October while campaigning. The program became effective on Oct. 4 but had been in the works for at least a year. FFRF points out that DOJ employees are not in any way inhibited by their employment from freely exercising any religious preference they may have for religious counseling services. State employees, including nonreligious and non-Christian employees, are being encouraged to seek out Christian counseling, while being denied secular counseling services by bona fide mental health practitioners. FFRF alleges there could be life-and-death consequences due to the fact that the agency chaplains aren’t required to have necessary mental health/substance abuse training.